Sometimes a good dose of humor is all you need. I’ve been in a bit of a slump lately. Not a reading slump, more of a mood slump. I didn’t really feel like socializing – it was more of a read, work, sleep kinda thing. Even my book conversations were somewhat uninspired. 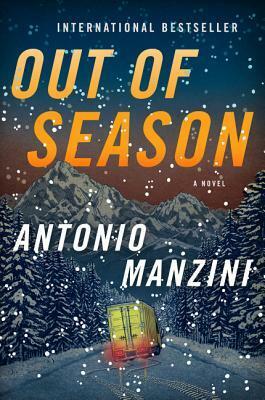 Then, I picked up an ARC of Out of Season by Antonio Manzini, and my mood completely changed. A clever, engaging new novel from bestselling Italian author, Antonio Manzini, following the dashing deputy police chief, Rocco Schiavone, who confronts his most riveting case ever. It’s the bitterly cold spring season in alpine Aosta, and a girl has been kidnapped. Chiara Berguet, daughter of the owners of a local construction firm, was targeted thanks to the sizeable debt her parents owe. But like many a best-laid plan, a blown tire causes the crime to go haywire as the kidnappers’ van skids off the road and crashes into a pair of larch trees. Both the driver and his accomplice die on impact, leaving the girl in the back, gagged and bound and unable to break herself free. Meanwhile Rocco Schiavone wakes to find himself in Anna’s apartment. She’s the best friend of his girlfriend Nora, and memories of the night before, a heated evening with Anna, return to him. As he sneaks out, he sees the first few snowstorm clouds of the spring season move across the sky, an ominous reference that something is off. If trouble at home and a case of kidnapping weren’t enough, Rocco will eventually have to contend with Enzo Baiocchi. Rocco was the one who sent Enzo to prison, and in the process killed Enzo’s brother. Having just escaped from prison, Enzo is heading north with a newly purchased revolver and, clearly, revenge on his mind. And when an unfortunate incident of mistaken identity makes Enzo’s act of revenge even more fiendish, it also presents a gruesome scene for Rocco to discover on his return home. Out of Season was originally written in Italian, and the ARC I read was translated into English, with an expected publication date of 10/2/18. Knowing ahead of time that this novel is an Italian murder mystery/thriller, I found myself asking what this novel could offer me, that I hadn’t already read. After all, this was my first time reading a translated book. Let me just say, I have never been more wrong. First of all, this novel is a mystery, and mystery you do get. I usually like to hazard a guess as to whodunnit at the beginning of the novel or at least partway in. This time, I had absolutely no clue as to how the book would turn out. And if that isn’t suspenseful, I don’t know what is. Each new clue that Rocco found out completely changed my perspective on what was happening, and more than once my theories were completely wrecked. Now it may have been a little hard for me to keep up as well, because everything was just so Italian. This resulted in me being a little slow on the upkeep of names, and I had to write them down. They were all so foreign to me that remembering them was nearly impossible for the characters that were secondary. It didn’t help that they would randomly switch between first and last names when addressing or talking about someone throughout the novel. Basically, if you’re hopeless with Italian names, I suggest you take notes. However, this novel is also a great exposure to northern Italy. The places, the food, etc., are all described just enough for you to feel as though you are a tourist in this town, and just happen to have arrived in the middle of a police investigation. If you enjoy being exposed to other cultures, this book is for you. However, the absolute star of this novel was not the mystery, nor the authentic-ness of the setting and characters. The development of the characters themselves was what really made this novel for me. Every character, every conversation is humorous, sarcastic and witty. The main character, the deputy chief, in particular is an ornery man that I fell in love with. He whines and he whines, but give him a little room and he grows on you so much. He has such a zest for his work, that he can’t help but circumvent police procedure, and I love him for it. And of course there’s his zingy one-liners that sound exactly like me; this is a man with no speed bump between mouth and brain when it comes to his officers. Even the laughingstock of the police headquarters D’Intino and Deruto (who I have privately labeled Dumb and Dumber because I can not for the life of me remember the Italian characters that Rocco compares them too) are adorable – they made me laugh all throughout the novel, and I even felt a little sorry for them towards the end. Guys, I’m serious – if you want a thriller but also want a light read, some adult humor to lighten your day you absolutely. must. read. this!!! As I mentioned earlier, you can preorder it now, so when it comes out on the second of October, you’ll be all set to read it. Apparently, this novel is coming to the States as a TV show soon as well, so if you’re like me and have to read before you watch, now’s the time to do it. Also, I have to do some research, but there’s a little bit of a cliffhanger/sad ending at the end of this novel, and I’m not quite sure if there are more books outside of this one (in a series) that just haven’t been translated yet. If anyone knows, drop a comment. And me? Well I’ll be sitting around laughing at Rocco’s epic zingers. I do like the sound of this one! You had me at sarcastic and witty! This sounds really fun! I love it when books have a very vivid setting that makes you feel like you’re on vacation somewhere. A quick check of german Amazon showed me that they have 4 parts of the Rocco series. So I’d expect you get more soon, too! Based on what I found on Goodreads it looks like there are three already translated (which you’d never guess, the book reads like a stand alone) lol. But I plan on checking those out too! I do love quality adult humor, I want this! I like the sound of this book. The cover is gorgeous too. Great review.